In today’s modern world technology is an indispensable part of everyday life. It seems like life without the Internet and social media has become unimaginable as most people spend at least two hours per day on some sort of a gadget. The constant evolution of technology brings many advantages which improve the quality of life. So far, probably the most revolutionary invention has been the computer which has greatly evolved in design, construction and purpose throughout the years. A popular choice these past few years are notebook computers or laptops. These are small in size and have many advanced features for performing various tasks. However, despite all the benefits notebook computers provide, they also have some disadvantages. Prolonged time of usage can lead to various health problems as their design can cause muscle and joint pain and it can also increase the risk of shoulder, wrist or arm injuries and strains. Plus, the way it is designed does not allow for comfortable sitting positions. All of this can lead to bad posture as well as serious neck and back problems. However, it is not all bad news; the solution to all these problems is buying a quality and practical ergonomic notebook stand which will not only improve your posture, but it will also make working on your laptop much more pleasant. It is specifically designed to provide comfort while sitting and enhance the operation of laptops. Restricted airflow is a common problem when you use a laptop on a flat surface. However, that is not an issue with notebooks as the notebook stand helps in increasing the airflow and it can even include fans that could additionally improve its operation. The adjustable features of the notebook stand make typing easier and less tiring. It is a well known fact that it is more ergonomic to have the keyboard raised at an angle than using it in a flat or some other uncomfortable position. Working this way not only improves efficiency, but it also puts less stress on your wrists and hands. There are three basic types of ergonomic notebook stands that have different designs and of course provide different benefits. Adjustable notebook stand: very practical and easy to use. It has a modern design that is suitable for any laptop or notebook and enables you to adjust the height of the screen to your own preference. Portable notebook stand: lightweight and very convenient – the perfect companion for your notebook. You can take it with you anytime and use your laptop pretty much anywhere. It incorporates a smart slim design with advanced features. 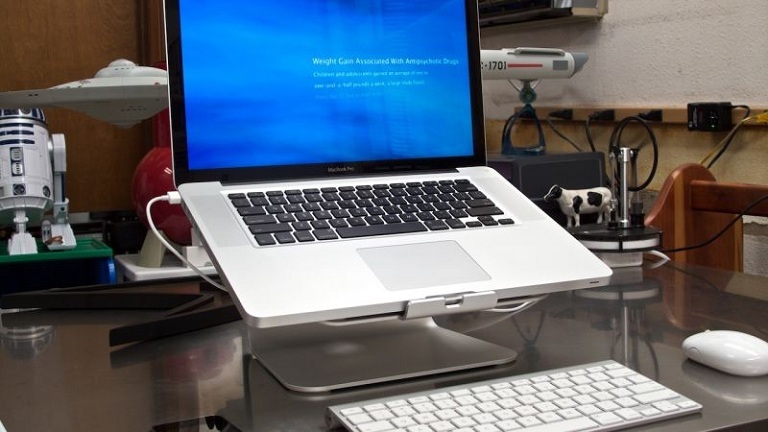 Desktop notebook stand: it usually comes with additional features like USB hubs or document holders. It is the perfect office solution as it improves organization and efficiency.